The Rockville RPM109 is a 12 channel wood cabinet powered mixer with USB/SD input and LCD display. This mixer is one of the best sounding powered mixers on the market. This will compete with the most premium brands on the market in terms of sound quality and how much power this has. I personally tested our RPM series of powered mixers and I was completely blown away! I ran this to (2) Yamaha speakers and even with the volume turned up half way these were insanely loud! When I cranked the volume to 90 % the clarity was just un-believable. The power amp built into this mixer is 450 x 2 RMS @ 8 ohms and 600 x 2 RMS @ 4 ohms. We rate the RMS very strictly the way famous brands like Mackie rate their items. We also supply you with program and peak ratings but RMS is the true continuous output power you should look at. This powered mixer is rugged and tough! It is enclosed in a high quality wooden enclosure which can take a real beating! This model has 12 channels making it versatile enough for most parties and gigs. It has an adjustable 3 band EQ (high, mid, low) on each channel along with a dual 7 band master EQ. We added built in Bluetooth, USB, and SD players giving you a lot of playback options. 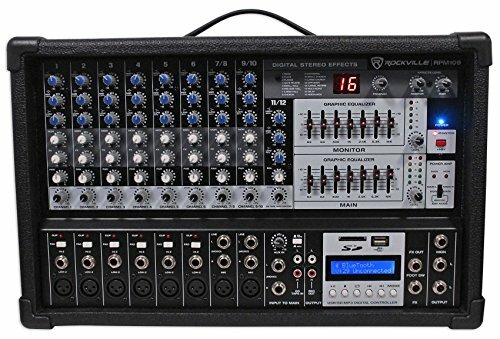 Rockville RPM109 12 Channel 4800w Powered Mixer, 7 Band EQ, Effects, USB, 48V. RMS Power Output:.....600w x 2 @ 4 Ohm.....450w x 2 @ 8 Ohm.....1200w x 1 @ 8 Ohm. Program Power Output:.....1200w x 2 @ 4 Ohm.....900w x 2 @ 8 Ohm.....2400w x 1 @ 8 Ohm. Peak Power Output:.....2400w x 2 @ 4 Ohm.....1800w x 2 @ 8 Ohm.....4800w x 1 @ 8 Ohm. 12 Channel mixer section: 6 mono channels, 3 stereo channels. 1 dedicated USB/SD input. Built-in Bluetooth playback. Studio-grade stereo FX processor with 16 presets including reverb, chorus, plate, delay, chorus, cathedral and various multi-effects. 8 high-quality mic preamps with switchable +48 V phantom power for condenser microphones. 3-Band EQ (high, mid, low) per channel. Pad Switch on each Mono Channel. Clip LEDs on each Mono Channel. Dual Stereo 7-band Graphic EQ allows for precise frequency correction of monitor and main outputs. Selectable stereo (main L/R), double mono (main/monitor) or bridged mono amplifier operation mode. Monitor Level Knob with 5 LED Level Meter. Main Level Knob with 2 x 5 LED Level Meter. Dual 1/4" Stereo and Dual RCA Aux Input with Independent Level Knob for External Signal Sources. Internal switch-mode power supply, noise-free audio, superior transient response and very low power consumption. 1/4" Foot-switch Input connector. Dual RCA REC Out. Dual Speak-ON jacks for Monitor Output. Dual Fan vent Cooling System. 110-120V power supply. Dimensions: 18" x 11.22" x 11.41". Weight: 30.9Lbs. NOTE: Refer the User Manual before use.